This delicious and versatile Spanish Chorizo by The Abbott's Butcher is crafted with garlic, oregano and Spanish Smoked Paprika to make this ground sausage alternative zesty, tasty and bright. Savor it in a breakfast scramble, use in tacos or enchiladas, or add to your favorite recipes for a tangy kick anywhere you'd normally include meat alternatives! 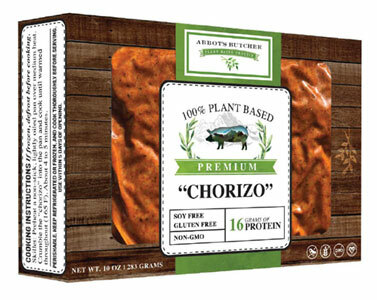 Gluten-free and packed with 16 grams of protein per serving, this Spanish Chorizo is free from cholesterol, saturated fat and preservatives, and contains no artificial colors or flavors. 10 oz. ( 283g) package is $8.49.